Boeing recently announced the development of a self-cleaning bathroom it hopes to someday start using on its aircraft. According to the company, the entire space can be disinfected in just 3 seconds, thanks to a Far UV light system. Though the type of UV light used is not considered harmful, it would only be activated at times when the lavatory is unoccupied. Jeanne Yu, Boeing's Commercial Airplanes Director of Environment, said, "We're trying to alleviate the anxiety we all face when using a restroom that gets a workout during a flight." "In the prototype, we position the lights throughout the lavatory so that it floods the touch surfaces ... once a person exits the lavatory. This sanitizing even helps eliminate odors." Further testing will be performed before the feature is made available. 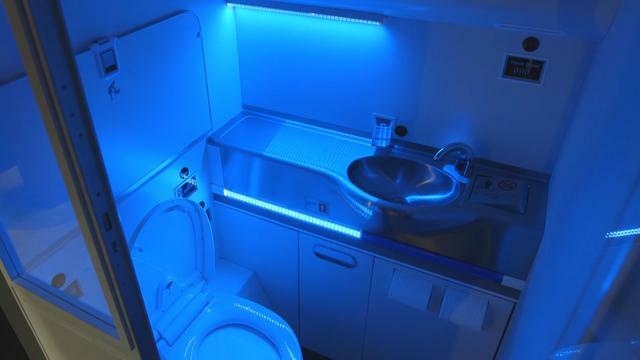 The aircraft maker is also exploring adding even more touchless features to airplane restrooms, including automatic soap dispensers, trash flaps and toilet lids and seats.